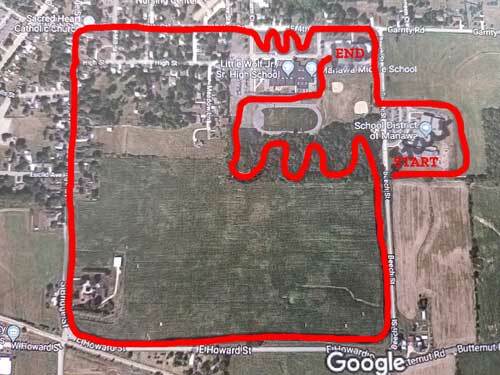 The School District of Manawa will host a district-wide Color Run on May 18, 2018. This event is designed to help promote healthy choices and to encourage fun outdoor activity for students, staff, families and the community. The Color Run is an untimed color race event where the runners will get covered in powder paint from head-to-toe. The powder paint that is going to be used is certified non-toxic, biodegradable and free of heavy metals. The paint powder consists of cornstarch, baking soda, and FD&C dyes. This event is designed to promote outside activity, healthy lifestyle, and engage students, staff, families and the community. All students from grades Pre-K-12, staff, family members and community members. All students will receive a free Color Run kit including glasses, color pack, and a t-shirt for the event. Other participants who want to purchase a race-day kit can pre-order one for $10 by April 13, 2018. What is the money for? The money raised will be used to aid learning in both the Elementary and JR./SR. High Schools; all grades and subjects will benefit. We are fundraising to enhance the technology in the School District of Manawa. This year we plan to use funds to help Mrs. Krueger continue to expand her Makerspace and Mrs. Wright’s Lego Robotics. Please consider supporting this fun and healthy experience for our Manawa students. We would like every student to collect at least $30 in pledges/donations. MES students will receive incentives for the grade level with the highest participation of donations and for the grade level with the highest average donation. Students will have a chance to win some awesome prizes through a drawing held May 11th. For every $10 in pledges or donations collected, students will earn a ticket that will be put in the prize drawing. Prizes will be handed out at school on May 18, 2018. Some prizes will not be sent home with students due to the value of the prize, age of the student, etc. Parent(s) will be notified to arrange pick up in the school office for those prizes. to THANK YOU again for your support!